As easy as it often looks to be Tony Stark—the success, the money, the endless array of awesome gadgets—the question of who, exactly, Tony Stark is as a person is more difficult to pin down. From movie to movie (and often even within a single film), no other character goes on as transformative a journey as Iron Man. The Marvel universe will certainly go on after Infinity War (and the conclusion to its story, the title-still-a-secret Avengers 4), but it will likely look rather different, and one of those changes will almost certainly be Iron Man. People love Iron Man: Among the plethora of examinations of every Marvel hero, there are summaries of his story from the first frame of his own movie to Captain America: Civil War, and even pieces that use his arc as a metaphor for Marvel Studios itself. As played by Robert Downey Jr., Tony Stark has been the lodestone in this cinematic world, the centerpiece around which all other characters have aggregated ever since the first Iron Man launched the Marvel Cinematic Universe. Downey’s hyperactive charisma was a large part of the character’s success, and when the history of this era of filmmaking is written, the actor will rightfully get credit for his work. But Downey wouldn’t have anywhere near as much to do were the character not such a constantly evolving wonder. Audiences return to Tony Stark time and again not just because he’s written as a funny and breezily engaging presence, but because his journey over the seven MCU movies in which he’s thus far appeared (eight if you count his Incredible Hulk cameo) is ever-changing, a growth and difference to which no other hero in the studio’s roster can even come close. So Tony Stark becomes Iron Man, shutting down Stark Industries’ weapons manufacturing and using his suit to fight the criminals around the world whom he unwittingly helped arm. He rejects the profit-above-all, innovation-trumps-consequences mentality that previously defined his behavior. It’s quite a transition for the previously carefree inventor and billionaire. But he’s got another problem: a piece of metal trying to shove its way into his all-too-human heart. And by Iron Man 2, that confrontation with his own mortality becomes the next phase in his evolution. Tony, a man traumatized by his time as a captive, builds a suit of armor to keep himself safe, and exert some control over those he sees as the victimizers. (And when the U.S. government asks him to share his technology, he flips them the bird.) But in a lovely bit of symbolic irony, the power source keeping that suit running—the very thing powering his security blanket maintaining a layer of metal between him and the rest of the world—is slowly poisoning him, the palladium required to keep it going killing him by degrees. He spends most of the film trying to deal with it the way he previously used to address conflict and psychological doubt: by pushing it (and others) away, becoming increasingly isolated and hedonistic to ignore and forestall the inevitable, his “what, me worry?” attitude a defense against the consequences of his life and actions. It’s an intense journey, regardless of the ultimate quality of the film, and over the course Iron Man 2, Stark goes through another profound transformation. He grapples with the legacy of his father, coming to a kind of terms with the insecurity and sense of fatherly distance that shaped his identity. He surrenders to the need for others, teaming up with James Rhodes in order to fight the threat of Ivan Vanko and opening himself emotionally to Pepper Potts. And by the end, he’s reaching out to Nick Fury about being a part of the Avengers Initiative, as the “it’s all about me” selfishness is finally negated by the brush with death and desire to reconnect with the world. This is the Tony Stark we meet at the beginning of The Avengers. He’s been rebuked by Fury, but when Loki arrives, Stark realizes the gravity of the situation, and signs on to help. Of course, the one thing that hasn’t changed is Tony’s ego regarding his own talents. His standard M.O. as the smartest guy in the room has always led to the assumption that he’s a natural leader, the person who should be in charge at any given moment. The entire film is a slow-burn case study in watching Iron Man come to grips with the fact that he’s not the leader of the Avengers—and not only that, but he doesn’t deserve to be. Repeatedly butting heads with Steve Rogers, Tony talks down to the war hero, because he knows Rogers is out of his depth when it comes to a battle of brains. But the confrontation with an enemy Tony isn’t equipped to handle on his own starts pushing him in the direction of acceptance. First, in the realization that this is a war, and by playing the role of the cavalier loner dropping in to save the day (rather than the soldier he needs to be to win) he’s putting the entire group—and planet—at risk. Second, by admitting that Captain America is the man for the job, and the true leader of the Avengers. The “Call it, Captain” moment, when Iron Man openly acknowledges his subservience to Rogers when it comes to leading the fight, has been rightly acknowledged as a key line; it’s another huge moment of character development for Stark. Previously, he mocked Rogers’ valorization of nobility, of being the one to sacrifice themselves for the greater good. But at the film’s end, Tony does precisely that: He flies through the wormhole to deliver the nuclear warhead to the aliens. He gets lucky and falls back before it closes, but the point has been made: This isn’t the Tony Stark who began the movie. 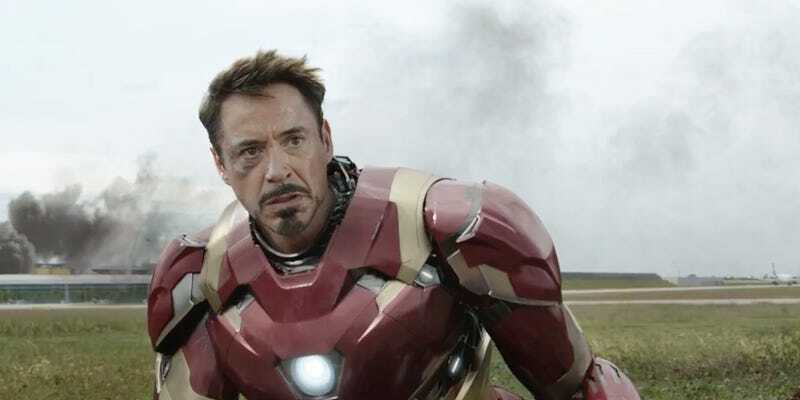 Iron Man 3 doesn’t have quite the same changes in personality, but it has one of the most symbolically important shifts in Tony’s character, in that the whole film is his internal struggle to process the trauma he endured during The Avengers, and eventually defeat his insecure need for armor. When the film opens, he’s in denial of his panic attacks, building ever more elaborate Iron Man suits to try and push back his demons. But by being stripped of his suits, his resources, and forced to rely on nothing but Tony Stark, the man, he comes to grips with his issues, admitting some things are simply bigger than he’s capable of processing and renouncing his previous need for control. It’s hard to imagine a more potent demonstration of his newfound acceptance than destroying all his suits and casting the arc reactor—embodiment of his need for that literal protection—into the ocean. And so Tony cajoles Bruce Banner into helping create the very artificial intelligence that ends up almost killing everyone. His desire for the ultimate security ends up being the biggest vulnerability. Yet he doesn’t learn from his mistake until after Ultron has been defeated. In fact, he doubles down, creating Vision in hopes of defeating Ultron—a good monster to destroy an evil one. He gets lucky this time around, but it’s not until some time has elapsed, and his hubris is confronted with the consequences of his behavior at the start of Captain America: Civil War. We already know Tony is haunted by what he’s done before he’s confronted in the hallway by the grieving mother of a young man killed during the final battle in Ultron. Tony feels culpable for the death and destruction, and is seeking absolution, some way of easing the burden of his guilt. He finds it in the Sokovia Accords, a document shifting authority for the actions of the Avengers to the United Nations. The movie works because Tony has a valid argument: Why should a group of superpowered individuals be above the law, doing whatever they want? But his endorsement of the deal is wholly personal. Think about what a transformation he’s undergone: The man who once told the U.S. government to go to hell is now actively seeking out its blessing, the former lone wolf now eagerly embracing subservience to a governmental body. The good soldier. And as we come to what may well be the end of his arc in Avengers: Infinity War—certainly Robert Downey Jr. has to be considering hanging up the CGI suit, and there’s no way Marvel wouldn’t want to have the opportunity to write such a change into its narrative—Iron Man stands as the man who threw his friends in jail, the person who saw law and order as more important than maintaining control, because control is what caused his crippling guilt. He may not have been wrong, ethically, but the personal reasons, not the greater good, are what now shred his sense of peace. It’s part of why he’s so concerned about little Peter Parker in Spider-Man: Homecoming. Stark is back to being the public face of the Avengers, but he’s lonely. He’s made amends with Pepper Potts (she dumped him prior to the events of Civil War, thanks in part to his refusal to stop Avenging), and wants to repair the personal relationships in his life. So he takes a high-school kid under his wing, tries to show him the ropes, mentor him, and groom him to be ready to become a superhero Avenger like Iron Man. That Parker ultimately refuses to join for the time being, even while forging a friendship with Tony, is less important than Stark’s desire to rebuild a family—in his personal life, in his work, and the inevitable overlap between the two. The ultimate outsider, the one who used to look down on everyone, is now just trying to get the band back together. That’s one hell of a journey; no wonder the reactor that once kept him alive is called an arc.